Before 1969, City Car, White Top, Checker, Yellow and Badger were the major cab companies in Madison. Small family owned enterprises, several had been operating since the 1920's. After 1969, there was a series of sales, splits and name changes. In 1972, City Car went out of business. Several individuals obtained single permits for one driver operations. During the summer of 1973, a union organizing drive began at Yellow Cab, Madison's largest permit holder. By November, Yellow employees had voted to be represented by Teamsters Local 695. For five months they bargained for a contract. They were finally successful after a three and a half hour strike in April, 1974. In February, 1975, the Union began negotiations for the second contract. It was soon apparent to the negotiators that management wanted to break the Union. The employees went on strike in April, 1975. On July 1, Yellow went out of business. Many of Yellow's ex-employees went to Checker Cab, which purchased Yellow's equipment and captured Yellow's market share. But Checker's equipment was generally substandard, and it remained that way despite the large increase in revenue. Employee morale was low. Workers had few benefits or rights, and little control of their workplace. 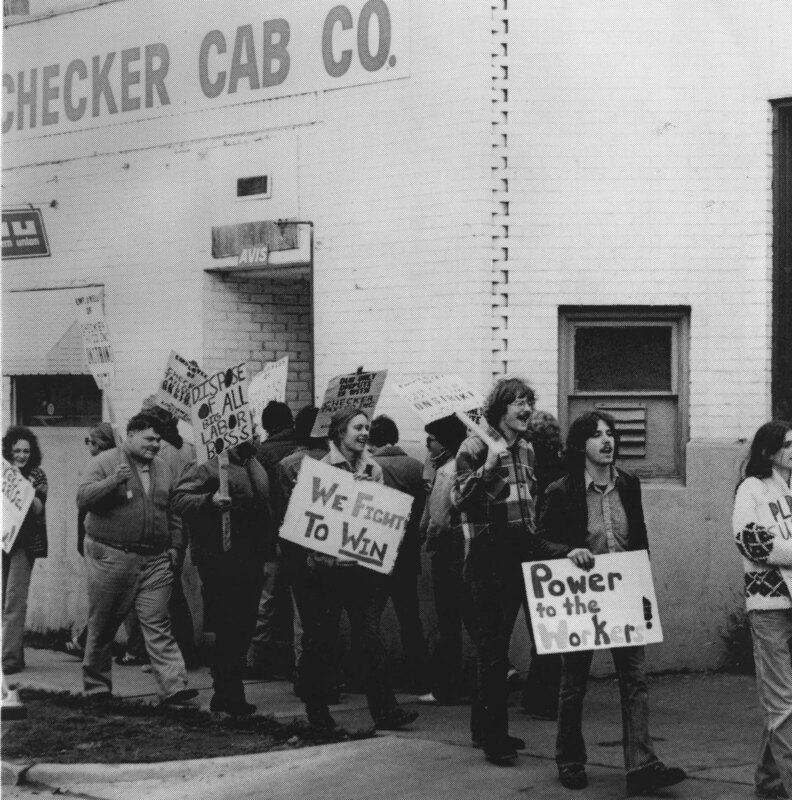 In the summer of 1976, a union organizing drive began at Checker. Over seventy-five percent of the workers signed certification cards for the Retail Clerks Union. A general meeting was called so the Clerks could meet their potential new members. When thirsty cabbies downed several cases of beer, and clouds of sweet smelling smoke rolled through the room, the Clerks had second thoughts and withdrew their support. Aware they were without legal protection after the withdrawal of the Retail Clerks, the organizers quickly contacted other unions. Within a week, the Organizing Committee recommended joining the Laundry and Dry Cleaners International Union (LDIU). In the fall of 1976, the LDIU charted the Wisconsin General and Industrial Worker's Union (WIGIWU), Local 10-4 to represent Checker employees and in December the employees endorsed it as their sole negotiator. Union Representatives met with management during most of 1977 to hammer out a contract. Discussions proved unproductive. However, after a four day strike in September, 1977, Checker management caved in and signed a contract. During the next year, negotiations moved slowly and relations were strained. Employees filed 25 grievances. None were resolved. In September, 1978, talks broke down and for the second time in twelve months, a strike was authorized. Management tried to maintain operations with scab labor, but the union shut them down completely within a few days. In December, rumors surfaced that Checker would stay closed permanently. A variety of sentiments developed among the strikers. Some felt guilty about getting employees into something which might cost them their livelihoods. Some were frustrated and angry because the union was unable to reach a negotiated settlement. Some began to feel that if Checker did close permanently, it would be better than working for its management again. In January, 1979, ex-Checker workers Steve Krumrei, Jim Cooley, Dave Everitt, Jim Symon and Jim Applebaum resolved to create a worker owned company. They felt they had, amongst the membership, enough expertise to be successful in the taxi business. When it became apparent that Checker management would not reapply for taxi permits, Union Cab incorporated. Later that month, it applied for 20 permits. From March to June, Union Cab contacted lawyers, made financial projections, applied to the Federal Communications Commission for a radio license and began seeking the estimated $150,000 necessary to begin initial operations. By early June, Union Cab had only obtained enough money to put a down payment on the radios. Every day was a juggling act, as projected expenses had to be reevaluated in light of available sources of capital. Finally, a loan package was arranged: $95,000 came from the First Wisconsin Bank (Firstar), $35,000 from the Madison Development Corporation, $15,000 from Wisconsin Horizons and almost $15,000 fro the sale of preferred stock. On October 29, 1979, Union Cab of Madison Cooperative, Inc. opened for business, with 11 new cabs. It was difficult at the beginning, with no yellow pages ad and an average wage of around $0.80 per hour. The Cooperative lost $35,000 in the first three months. Losses were expected, but their magnitude concerned everyone. On February 14, 1980, the City permitted the cab companies to raise their rates. At that point, Union turned the corner. On April 23, 1980, Blue Cab folded, leaving Union with a monopoly in the meter business. One week later, Madison Metro bus drivers began a two month strike and business increased dramatically. Union added five cabs, and what was normally the slowest time of the year became a bonanza. In September, Union added five more cabs. On October 14th, the BoD selected Steve Stepnock as the first Workers' Council Co-captain. Four months later, he became the Personnel/Operations Manager, following founder Jim Cooley's resignation. As the cooperative grew and evolved into a successful business, its members began coming to terms with the realities of operating in the context of the larger community. Some members wanted Union to be a springboard for spreading individual ideologies. Others wanted Union to be run more like a conventional business. In the spring of 1982, the BoD surveyed member opinions regarding potential political, social or charitable involvement in the community. In April, based on the finding from the survey, the BoD passed a solicitation policy which stated that the cooperative “shall not be affiliated with any individual or organization whose solicitation is deemed … to be essentially political, religious, or charitable in nature.” The policy also forbade official company statements or the disbursement of co-op funds in support of such groups, and required such groups to obtain approval from the BoD prior to soliciting on cooperative property. In November, 1982, after having outgrown its facilities at 703 E. Washington Ave., Union Cab moved to 1321 E. Mifflin St. The new location had more office space, a paved lot, and a much improved maintenance area. On January 1, 1983, Union Cab expanded its operation with three airport limousines. The move marked the recapture of the last portion of the Checker Cab bargaining unit lost in the strike. In the winter of 1983-1984, the volume of business was so great that Union was unable to provide the service that the community had come to expect. By February, morale was low, due to UC's service weakness in the winter months. The BoD elections drew only four candidates for the four available positions. There was a move to reopen nominations to attract more candidates but the BoD refused because they felt that everyone who had cared to run had a chance to do so. In March, the BoD appointed David (Rosebud) Sparer permanent coordinator of the monthly newsletter. The position was designed to improve morale and provide more effective internal communications. In July, 1984, outspoken management critic Rob Greenburg resigned his BoD seat. He cited several areas of dissatisfaction with the Co-op, including an inability to deal with winter business, management inflexibility in personnel decisions and the BoD's failure to adequately evaluate management. In Greenburg's words, the firing of an employee “was terribly disappointing to me and soured my enthusiasm for us as a worker co-op because it indicated the loss of our heart, soul and spirit.” His resignation stimulated much discussion around the Co-op about how to improve UC's policies, organization and operations. By the fall of 1984 it was apparent that Union Cab was outgrowing its internal structure. On October 9, the BoD voted to work with an advisor from the Inter-Community Cooperative Council (ICC) on a plan to reorganize the management structure to improve its efficiency. In February, 1985 the BoD elections drew 11 candidates for the four seats, demonstrating a renewed willingness by members to get involved and participate. In March a half-time Personnel Manager was hired, Hank Sommers. He immediately began a review of personnel policies and sought to standardize procedures and job descriptions. In April the shop steward system was adopted by the BoD to provide a direct link between workers and management. Each shift and each department chose a person to represent them. In July, Union Cab borrowed $170,000 from the National Cooperative Bank for 15 new Reliants to replace the aging fleet of Aspens and Volares and a new SMT-80 communications system from Motorola, which included an in-house computer. On July 12, Union Cab entered the computer age with the first of its new Reliants. In each cab was a data transmission board which allowed drivers to communicate with dispatch by pushing buttons indicating location and status. Several months of frustrating trials of the system followed until all the bugs were worked out. In August, 1985 Union began teaching a required Defensive Driving program to all new employees. The program was taught by two drivers who had been certified by the Department of Transportation. In October, Steve Stepnock ended his ten year attachment with the cab industry and resigned as Operations Manager. He was replaced in November with Mary Heller, a long-time Union employee. Mary only held the position for only a few months, and was replaced by Ned Miller. In November UC adopted a new Employee Assistance Program designed to refer troubled employees to appropriate agencies where they could receive help with their problems. In April 1986 the BoD approved an anti-harassment policy which prohibits unwelcome advances, slurs or physical conduct toward other co-workers or customers. In that same month a vacation plan was approved providing a week's paid vacation for full-time employees. In June Union was confronted with a new competitor. Madison Taxi arose from the ashes of Bender Cab. MT began with eight cabs and one limo and cut into Union's business an estimated 10%. In April of 1987 General Manger Krumrei decided that after seven years with Union it was time for a change and submitted his resignation to the Board of Directors. Also resigning was Operations Manger Ned Miller. The BoD immediately set up an Executive Search Committee and, after reviewing more than one-hundred applications, hired long time Union driver, dispatcher and Board member Perry Benson to fill the position of General Manager/Operations Manager. Benson, in turn, hired weekday dispatcher Sal DiGiosia as his assistant. Picked to fill the newly created position of Financial Manager was Martha Crawford, an MBA who was one of the founders of Women's Transit Authority. Later that fall, Maintenance Manger John Disch left the Cooperative and was replaced by Brad Bergstrom. Faced with eroded market share and declining revenues, the new management team began by cutting expenses and attacking the business account market. Delivery business doubled in less than a year's time, the passenger market began to return to Union and red ink was replaced by black. Increasing revenues produced fatter paychecks and worker morale improved. In the fall of 1987, the BoD, judging the market to be too unsettled, decided against a meter rate increase. The alternative was cutting wages and benefits. In December of that year, the Board “bit the bullet”. Wage cuts were designed to be as equitable as possible, and to put the Cooperative in a break even mode for the '87-'88 fiscal year. Market share and business volume continued to grow however, and Union was able to turn a 1.2% profit. In the fall of 1988, secure in our hold on the market, and faced with increased expenses and the need to relocate, the BoD approved a meter rate increase. Concurrently, the Board completely revamped the pay structure at the Cooperative. Wage cuts of the previous year were rescinded, and a new system, designed to be more open and more equitable, was enacted. Also in late 1988 the Board of Directors approved a Pennsylvania Avenue location as the site for a new facility. The move was forced upon the Cooperative by the loss of the lease at 1321 E. Mifflin Street. After much discussion and reworking of the building plans, the blueprints were frozen and ground broken in the spring of 1989. In mid September, in an awkward move, operations were switched to the new offices and the first call from the new facility was dispatched on a Sunday. The new building featured a larger drivers' room, a lunch room, locker room, increased dispatch office space potential, a large conference room, an on site fuel depot and a much improved maintenance facility. Today Union Cab has gross annual revenues in excess of $7 million with approximately 230 active or probationary members and 65 cabs. We continue to operate under the principles of the Cooperative movement and maintain a “one-member, one-vote” worker democracy. Over a six month period from the fall of 1989 through the spring of 1990, the Cooperative replaced three quarters of the management team. General Manager Perry Benson, working closely with the Board of Directors, selected long time member Mike Gibson as the new Operations Manager, ace mechanic Kim Ipsen as the new Maintenance Manager and Cooperative newcomer Carol Beck as Financial Manager. In December of 1989, concerned over changing requirements for the Metro+Plus contract with the city, the Board of Directors voted to exercise the Cooperative's option to cancel the lucrative agreement. Faced with a large and unplanned for deficit due to the loss of Metro+Plus revenue, the Board enacted an across the board 4% wage cut. This cut allowed the Cooperative to end the fiscal '89-'90 year with a $25,000+ net operating income. The net income would have been greater except for the great Persian Gulf crisis of August, 1990. The skyrocketing price of gasoline not only ate into profits, but forced the Cooperative to raise meter rates a year ahead of schedule. The riding public, aware of our difficulties, largely accepted the increase and the Cooperative realized no net loss in market share. In the summer of 1991 General Manager Perry Benson was replaced by Richard “Red” Christensen, marking the first time a General Manager was hired from outside the Co-op membership. Shortly thereafter, Mike Gibson moved to the position of Account Executive, and long-time Union member Conrad Amenhauser was appointed to the position of Operations Manager. “Red” Christensen, using his previous experience in the Paratransit business, established Union Transit shortly after his arrival at the Co-op. The Paratransit division has been the fastest growing segment of Union's operations, with profits exceeding all expectations. Meanwhile, Metro+Plus decided to abolish the contractual requirements the BoD had objected to and offered a revised agreement. The Board accepted and gross revenues returned to their previous levels. By the end of 1992, the budget crunch was over and the 4% pay cut was returned in two stages. The Co-op moved to provide co-pay health insurance for all members working over 32 hours per week, making Union Cab one of the first taxi cab companies in the country to provide such a benefit. The cost of the insurance was offset by another meter increase, making Union Cab the most expensive taxi service in Madison and raising fears that ridership would drop. Fortunately, after a temporary drop in volume, business picked up again. It was clear that none of Union's competitors could provide the level of service to which Union's ridership had become accustomed. Union then went on the business offensive and developed a fleet of airport-only taxicabs, capturing a large share of Madison's airport business. After a shaky start, the aircab fleet began to show a profit. The spring of 1993 brought many exciting changes. Several late model “bubble” cabs were purchased, and the federally mandated conversion to propane fuel began. Union became a showcase for new taxicab technology when meters with built-in credit card readers and paper tape printers were installed in all of the cabs at no cost to the Co-op. In the fall of 1993, the Board decided to terminate the airport limousine service due to chronic revenue losses, and the shuttle vans were moved to Paratransit and lucrative student transport services. The aircab fleet was increased to pick up the slack in the airport business. 1995 saw many major changes in Union Cab, both as a business and as a cooperative. The membership adopted a Bylaw which added three Alternate Directors to the Board of Directors. They serve for one year and only vote in the absence of a Director or if a Director resigns. This addressed a long term problem of absenteeism at Board meetings as well as the (sometimes nasty) political fights that ensued whenever the Board would have to fill a vacancy . The Board also began a Team building workshop which created a Committee of the Whole at which managers, alternates and directors all had a vote. This was done to foster more communication and respect between the leadership of the Cooperative. Partially as a result, the Board saw only one resignation in 1995 – the lowest number ever in the history of Union Cab. In addition to internal political changes, the Coop also added a new school bus division with a roughly $900,000 per year gross, upgraded its computer system to a Unix and 26 Macintosh workstations, added two Managers and one technical support staffer, purchased the adjacent building at 2470 Pennsylvania Avenue and finally began phasing out the PDP-11 and upgrading the taxi dispatch office. All of these changes were taking place in a market where the local unemployment rate was only 1.8%. The combination of new work and a tight labor market created some tough times for the Cooperative and made the winter of 95-96 a tremendous challenge. However, the membership rose to the occasion and went into the spring strong and ready to begin grappling with the changes that will be needed to meet the future. By the fall of 1996 a new dispatch system was being integrated into our operations using Mobile Display Terminals purchased from Mentor Engineering (a Canadian electronics manufacturer) and our own proprietary dispatch software system. This system allows our dispatchers to silently send assignments and messages to our drivers via dashboard mounted computer screens. In the fall of 1996 Richard “Red” Christensen tendered his resignation and new General Manager JoAnn Michie started in January 1997. A reorganization of the management passed the Board later that summer. The change brought back a unified Operations Manager position together with supervisor positions for Bus, Taxi and Transit. Barry Heller was hired to be the Operations Manager. Jo Ann Michie resigned after just one year at Union,, and a search committee recommended – and the Board hired – long-time cab driver Bryan Walker to be the next General Manager. High debt hampered all new initiatives throughout 1998 and the early months of 1999. At the same time this debt imposed financial austerity it also created internal pressures for changes, and Bryan Walker held the line against any changes which might create new expenses or reduce revenues. After sixteen months he was asked to resign his post. By the time Walker left, the Cooperative had brought down its external debt considerably. The Cooperative's debt equity ratio was reduced from 2.6 to 1.2 by June 1999 – which marked the end of Walker's tenure. The Cooperative finished that year with 5.4 million dollars in revenue. Long-time driver, dispatcher, and Operations Manager Barry Heller was made Union’s new General Manager in the fall of 1999. The greatly improved financial position of the Cooperative was still in jeopardy, as many of the previous year’s revenue sources came from sources such as the school district, Metro+Plus, and other large contracts that would expire, or need to be rebid, in the 1999-’00 fiscal year. Union bid aggressively and won the Metro Plus contract which required a fleet of 10 mini-vans. The work brought a lot of business and a lot of debt. The school district work was not rebid, and the Metro+Plus work fell through after what seemed to be a successful bid. Approximately four dozen transit and shuttle vehicles and a dozen school buses were sold as Union scaled back the scope of its operations. Under Heller's leadership the board paid down debt and re-focused the cooperative as a cab company. The effort to recover economically was dealt a setback in 2001 after the attacks on the World Trade Center and the Pentagon.The resulting downturn in air travel and travel in general combined with a warm winter made 2001 and early 2002 bleak. In 2002, the board created a Strategic Planning Committee which instituted annual strategic planning, revamped the cooperative’s mission and wrote a vision statement. Since 2002, the cooperative has enjoyed steady, consistent growth along with the City of Madison. In 2003, the board once again examined the management structure. During this time, General Manager Barry Heller chose to return to driving taxi and became the first General Manager to step down from that position and stay with the cooperative. The board made the current President Karl Schulte the interim General Manager and then hired him permanently in that position. In 2003, the Cooperative ended a stalemate with the City and para transit activists who missed the high caliber of service provided by Union Transit. The Cooperative agreed to run at least one wheelchair accessible taxicab at all times. From 2002 through 2008, the cooperative experienced consistent and steady growth as medical accounts and the City of Madison grew. On average, the cooperative grew between 5-7% per year during this time period, while the City's employment maintained a steady 1% growth rate. During this time, the cooperative was able to turn its attention the internal issues brought one by a growing membership. It finalized the purchase of its primary building at 2458 Pennsylvania Avenue and began planning long-needed upgrades to the parking lot and the structures. In 2006, the board revamped the steward positions into a Stewards' Council. In 2007, the board commissioned Bruce Schaller of Brooklyn and the foremost authority on the taxicab industry in the United States to conduct a market survey. With fears about rapid growth, the effect of the Iraq War on the economy, and the environment on everyone's mind, the cooperative stewards held a forum on growth issues in 2007, in addition, the 2007-2008 Strategic Plan called for a 5-year projection and the creation of a Growth Management Plan and a trial period in alternative fuels. In 2008, gas prices skyrocketed in the spring almost erasing the cooperative's surplus for the year. While the co-op managed to finish in the black, it ended up being the most difficult year since 2001. On August 11, Union Cab raised rates by 6% (the second rate increase in 8 months) at the same time that people generally ran out of money. Not only did people stop spending in general, but the housing mortgage industry finally collapsed. The financial storm outside of Union Cab became a Cyclone as the Federal Government was forced to rescue the major mortgage lenders, Freddie Mae and Freddie Mac and then nationalize AIG, the largest insurance company in the world. Volume dropped significantly during August and September but started back up as October approached. Union Cab’s first Social Audit was conducted in the winter of 2008-09. For this inaugural Social Audit, the Social Audit Team chose to focus only on the mission statement of Union Cab: “To create jobs at a living wage or better in a safe, humane and democratic environment by providing quality transportation to the greater Madison area”. Just as the cooperative conducts an annual audit of its finances to ensure that the assets and equity have been managed properly and to make improvements in management, a Social Audit provides a clear definition of purpose for the membership. It may lead to better resource management and a strengthening of the membership base as the membership gains a better understanding of itself, its community and the organization. At Union Cab, the Social Audit will be used to help develop the Strategic Plan for the organization as well as provide direction to the Board of Directors for policy development and improvement. In the spring of 2010, Union Cab purchased three Priuses as part of an experiment to test the Prius's viability as a taxi. Later that year, a fourth cab company opened in Madison as a shared ride service, Green Cab, with 20 Priuses. While they marketed themselves as have the largest fleet of Priuses, they were unable to say they were the first cab company in Madison to run with Priuses. While the other two cab companies in Madison, Badger Cab and Madison Taxi, saw a drop in market share, Union Cab remained steady at about 41%. On January 1, 2011, after extensive membership-wide discussion throughout 2009 and committee work throughout 2010, the Board restructured the disciplinary system by enacting the Peer Review Policy which replaced the long-standing Shop Rules Policy. Adding to the already-existing Workers Council, Stewards Council, and Accident Review Council, this policy created a Mediation Council and Behavior Review Council, and moved all disciplinary processes from the General Manager to members confirmed by the board. In February 2011 the Wisconsin State Legislature introduced Act 10, legislation that would affect collective bargaining, compensation, and other benefits of public sector employees. The board created an ad hoc Solidarity Committee to coordinate the cooperative’s solidarity activities in support of labor’s right to collectively bargain. The committee organized weekly cab parades up State Street and around the capitol through March, with from 10 to 40 cabs participating. The committee organized a “Cooperatives for Labor” rally on the capitol steps. Discussions directly resulting from this rally led to committee members working with the Mayor’s office and UW Center for Cooperatives to produce the Madison Cooperative Business Conference in June 2012, an exploration of Madison's existing cooperative business community, cooperative best practices, and a discussion of what can be done to advance business cooperatives in Madison. Union Cab lost significant weekday revenue in June 2011 when the state restructured its non-emergency medical transportation (NEMT) system, by bringing in a private broker, Logisticare, to coordinate the transportation needs of medicare and medicaid recipients instead of letting each county coordinate its own transportation needs. GM Schulte recommended to the board that Union Cab sign a contract with Logisticare in order to keep this business, about 25% of Union Cab’s weekday revenue. The contract required that all drivers be drug tested and set rates well below the meter. When the membership learned of these stipulations a petition was circulated and a membership meeting held. There was overwhelming member support to not sign any contract that required drug testing or that was for sub-market rates. The board agreed with the membership and did not sign on. Badger Cab was the only Madison cab company to sign the contract, but after six hours of doing business with Logisticare also walked away. In the summer of 2011, after seeing significant gas savings from the three original Priuses and needing to cut expenses to offset the lost revenue, the board decided to restructure the fleet and passed a Capital Budget accelerating the turnover of Crowne Victorias to Priuses, a transition which was completed in early 2012. Some drivers and customers were not happy about losing the size, power and comfort of the Crowne Vics, but the gas savings and Union Cab’s commitment to minimizing its carbon footprint wherever possible were the orders of the day. The board also eliminated the long-standing $2.50 shift charge that was being deducted from every worker’s paycheck for shifts worked more than 4 hours in the fall. This gave drivers, whose paychecks were suffering due to the lost revenues, a little more in each paycheck, although it hurt the bottom line. In August 2011, General Manager Karl Schulte, a member since 1991, left the cooperative after the successful implementation of the Peer Review Policy. He is now managing a regional shared-ride taxi company, Running Inc. The board named then-Accounts Manager John McNamara as interim GM and started a nationwide search for a permanent General Manager. While interim GM, John expanded Union Cab's team management structure by creating a Steering Team to serve as management oversight, adding a Finance Team, and more clearly defining the charters of existing management teams (Operations, Green, HR/MAST). Business remained slow in the first half of 2012 with no surplus in site, so management started seasonal scheduling, laying off volunteers during the slow summer months. Union Cab closed the fiscal year (July through June) in the red for the first time since 2003. The board enacted a 5% pay cut in July in hopes of bringing the business back in the black. The fall saw a slow but steady increase in revenues, especially for the night and weekend business, so the board lifted the hiring freeze. The IT department was busy during the fall upgrading the dispatch software and, together with the Maintenance department, installing tablets in each cab to provide increased functionality and GPS tracking for drivers. Many training classes were held in an effort to make the transition from button-pushing to tablet navigation as painless as possible for the drivers. The transition was easier for some than for others. In April 2012 the board completed its GM search and decided to hire co-General Managers; John McNamara, who continued to serve half time as Accounts Manager and half time as GM, and Jim Stith, hired from outside of the cooperative as the other half-time GM. The board was looking to grow our business in new areas and thought bringing in someone from the outside would bring a fresh perspective to help develop new business strategies. Jim stayed with Union Cab for five months before leaving to pursue other opportunities. On January 2, 2013 Union Cab won its bid with Sun Prairie and started doing business as a shared-ride service for the city. Running a contract-based shared-ride service with busy school rushes presented many unforeseen issues that needed to be resolved. Membership grew as many of the workers who drove for the old Sun Prairie taxi company were hired as well as new workers hired to ensure that the contracted hours were filled. With the additional revenue coming in, the board lowered the pay cut to 3%. After a membership-wide discussion during the spring of 2013, the board eliminated the General Manager position and replaced it with a Business Manager position, which formally restructured management from a traditional, hierarchical system of management decision-making and accountability to one of team management. After another nationwide search, the board hired John McNamara as Union Cab's first Business Manager effective July 1, 2013. By the end of 2013 Union Cab was still heavily in debt after closing the previous two fiscal years in the red, and was not projecting to produce a surplus by year end, so the board instituted the first meter increase since 2008, raising metered trips an average of 12%, and gave hourly workers a 5% COLA, their first increase since 2008. The board also replaced the 3% pay cut with a $3 shift charge. In 2014 the balance sheet improved and revenues continued to grow, especially the credit card revenue. In April, Business Manager John McNamara, a member since 1988, left the Cooperative and moved west to finish his PhD in Cooperative Business Management. He is now working at the Northwest Cooperative Development Center as a worker cooperative developer. The board replaced John with then-President Paul Bittorf, another long-time member since 1991. Union Cab closed fiscal year 2013-14 in the black, but it was difficult to produce a budget for 2014-15 showing a surplus. The board switched once again from a shift charge to a 5% pay cut to help balance the budget. Sun Prairie’s revenues were not meeting its expenses at the contracted rate, so when Sun Prairie re-bid the contract for 2015, Union Cab submitted a bid with higher, more realistic rates. Union Cab lost the contract and ran its last Sun Prairie shift on December 31, 2014. While the revenue will be missed, overall profitability should be improved. Many Sun Prairie drivers stayed with the cooperative and learned the Madison business, while some drivers chose to transition to the new Sun Prairie shared-ride taxi company, Running Inc.
2014 also saw TNCs (transportation network companies such as Uber and Lyft) start doing business in Madison. The city allowed these TNCs to enter the market and operate unregulated, creating a huge threat to the city’s regulated cab businesses, especially at night and on weekends. Union Cab members are stepping up and trying to work with the city and other legislative bodies, as well as organizing with other taxi cab companies in Madison, to urge the city to recognize TNCs as cab companies and to enforce TNC’s operation under the same city taxi ordinances as the other cab companies.. As of this writing it is impossible to know how this will play out. In December 2014 “Creator” and IT Manager Brian Hill, a member since 1991, left the cooperative for the real world of IT development. Brian and his team created all of the dispatching, billing, scheduling and personnel software used at the cooperative since 1995 in some iteration or another. His departure meant the co-op can no longer support these software programs in a sustainable manner, so a search for out-of-the-box solutions ensued. 2015 will be a year of change for the cooperative. Transitioning from proprietary software to out-of-the-box software will mean that many long-standing processes, such as how calls are dispatched, will transform how the cooperative conducts business. This software transition should provide Union Cab many opportunities to provide better customer service and to better compete with the TNCs, including providing an app for customers so they can bypass the dispatch office phones and order directly from their smart phones. Restructuring the IT department from software developers to help-desk supporters should also affect Union Cab’s bottom line positively over the long term with decreased wage and hardware expense. Time will tell how smoothly these transitions will go. Today, as 2015 begins, Union Cab has approximately 255 active members and 22 probationary members, for a total workforce of 277, and 77 cabs. Gas prices have plummeted over the past six months, closing January at $1.99/gal, well under the budgeted projection. How long gas prices remain low is unknown at this time. Another unknown is the long-term effects of the new Affordable Care Act, which took effect January 1st. With gas and insurance two of the largest expenses for the cooperative, the effects could be substantial. And the competition of the TNCs will remain a direct threat to Union Cab’s revenue as long as the TNCs are allowed to operate unregulated. We intend to continue to grow, serving the transportation needs of Greater Madison, and providing good jobs at a living wage in a safe, democratic and humane environment. But Union Cab is more than just a business; it is an idea and an ideal. It is one of a very small number of worker owned and operated businesses in America. Some consider us the wave of the future, others think we will be relegated to the scrap heap of utopian idealism. Our Membership will determine which it will be.